Eye washes provide natural relief for irritated, inflamed eyes. Natural Eye Care recommends eye washes for a wide variety of eye conditions. Good lid hygiene can both soothe and prevent eye irritation. Eye irritation can be caused by conjunctivitis, bacterial or viral infections, dry eyes, hormonal changes, allergies, drug side-effects, dehydration, excessive screen time, windy or dry weather, smoking, ocular herpes, shingles, iritis, corneal inflammation, eye sties, chalazion, and more. Since eye irritation has many potential causes, consult a doctor or ophthalmologist before proceeding. Some conditions can be treated at home using eye washes. In consultation with a physician or eye doctor, you may be able to use eye washes in conjunction with prescribed medicine to speed healing and reduce discomfort. If you tend to get eye infections, keep your hands clean. Never touch your eyes with dirty hands. Clean hands also help prevent transmission of a highly contagious infection, such as pink eye. 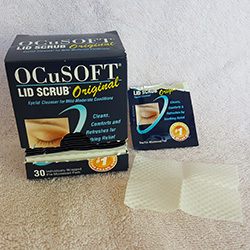 A single-serving commercial lid scrub is more convenient, but it is also expensive. Ultra-gentle, baby shampoo costs less than a penny. Fill a cup with warm water. 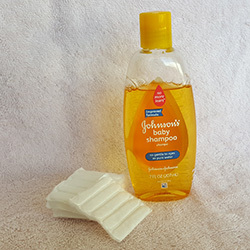 Add 1 to 2 drops of baby shampoo. Dip a soft cotton ball or cotton square into the mixture. You will not need to wring it out if you lean over the sink. If you have an infection in one eye, do not risk spreading it to the healthy eye. Skip the health eye, or use fresh cotton balls, water, and a clean cup for each eye. Splash clean, cool water on the eyes to rinse. This wash may be repeated several times a week, once a day, or twice a day. Steeped flowers, herbs, and leaves have been used throughout history to soothe inflamed eyes. Steep chamomile flowers, chamomile tea bags, black tea bags, or green tea in a pot or teapot. Dip cotton balls in a cup of the cooled tea. If you used tea bags, apply one cooled tea bag over each affected eye as a compress for 15 minutes. Note: If tea stings, discontinue use. Natural Eye Care offers a troubleshooting guide for red, irritated eyes. We also have a page on each eye condition. In our online store we carry an convenient and safe eye wash foam called LidHygenix Foam Eyelid Cleansor. In addition we carry targeted nutrition for the eyes, plus eye sty kits, eye masks, herbs, homeopathic remedies for irritated eyes.